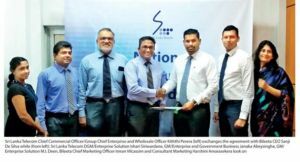 Sri Lanka Telecom PLC (SLT) has strengthened its Cloud Platform, “akaza” portfolio with signing an agreement with Bileeta Ltd. to resell the Entution Cloud ERP solution to the SME and mid-market in Sri Lanka and globally. This is one of the many hallmark partnership initiatives embarked under the AkazaCloud Program. Cloud ERP is deployed on the Akaza Cloud Platform, a secure cloud platform hosted by SLT Data Center, providing secure scaling of infrastructure and resources in computer, memory, storage and connectivity, to provide secure access to information for fast decision making regardless whether you are accessing from office or from a mobile phone. Significantly the customer will get a single bill for all subscribed services under the present billing relationship, with the customer having the facility to pay for subscription via the Payment Gateway. Akaza Cloud Program has presently in its growing partnership portfolio, solutions catering to Enterprise E-Learning, Hosted PABX, Omni Channel Contact Centre, and Hosted email and messaging, and firewall as a service. Cloud ERP Product – Entution is a cost-effective cloud based ERP solution which can be implemented within a reasonably short time span and can also reduce hardware, infrastructure and maintenance expenses by hosting the application on a public cloud. Entution ‘Journeys’ is a revolutionary concept created by Bileeta which can help our customers understand their business journey within Entution. This concept will help the customers simplify and better understand their business processes when mapping their requirements into Entution. It also gives the customers a 360 ° view of their business and can identify constantly evolving processes and scalability requirements based on the Journey.